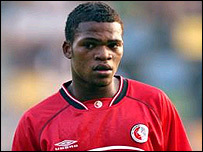 The transfer of striker Collins John from FC Twente to Fulham is being investigated by the Dutch FA (KNVB). It is reported that John's agent, former Ipswich star Romeo Zondervan, is not properly registered with Fifa. The KNVB has now opened a case into the deal which saw the Liberian-born 18-year-old move to the Premiership on a four-and-a-half year contract. "If rules have been broken then it is a case for the prosecutor," said KNVB spokesman Frank Huizenga.